A race livery is almost as important as the parts that go underneath it. 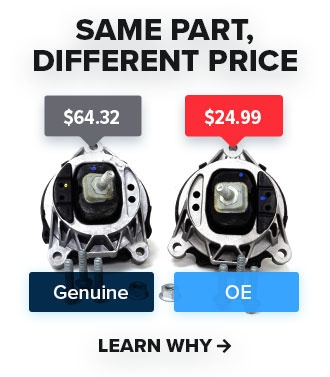 Not only is it the only thing that distinguishes one race car from another, but it often represents the involvement and partnerships between the team and those funding the efforts. Last but not least, there's a ton of thought, skill, and time that goes into designing each one. For the 2019 TC America season, we're proud to finally unveil ours. For the 2019 season, we hired Andy Blackmore for his graphical expertise. Over the last twenty-five years he's designed some of the most recognizable liveries in motorsport. You can find one of his designs in almost every major racing series across the globe since the late 80's. His work isn't just contained to race cars, either. Andy is also known for his styling of the Hoonigans Mustang ‘Hoonicorn’ and the ‘Hoonitruck’ and his work with game developer EA on the Need for Speed series. Last year alone, fifty-five chassis ran with Andy's designs in series ranging from IMSA to the WeatherTech Le Mans, and Formula Drift. For this year, as we do every year with FCP Euro Motorsports, we created an evolution of the previous years livery rather than an revolution. We still want our fans and family to recognize the familiar blue, black, and white colors of FCP Euro. 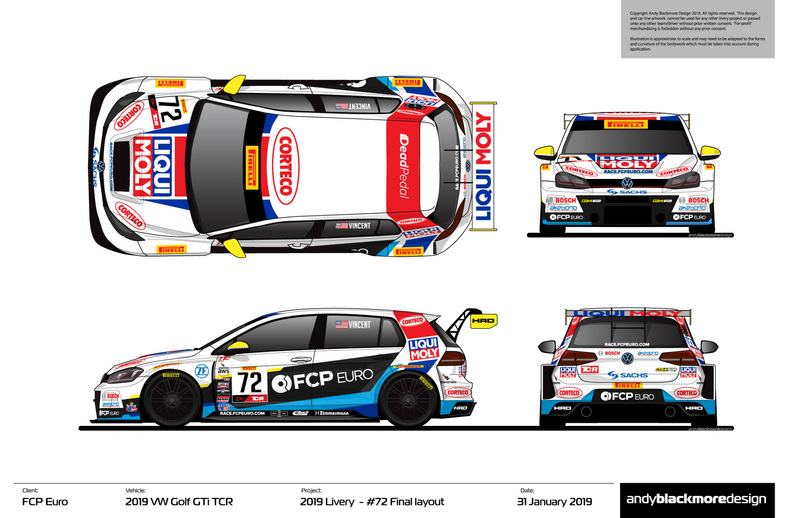 During the design of our liveries, I had the opportunity to speak with Andy about how he ended up designing liveries, his process, and how it applied to our VW GTI TCRs. EM: How did you get into design, and more specifically, livery design? AB: I've always been into cars and design, so that directed my years at College and University. I completed my degree in Vehicle Design (Styling) at Coventry University, in England. As a teen during the 80's, I started creating livery designs and won competitions with Renault and Toyota UK. The later design for these competitions ended up being the basis of a BTCC livery. Once I graduated university, I worked for a company that did contract work for McLaren—my first projects were the McLaren F1 GTR Gulf and West liveries, and that led to a job at McLaren. EM: Do you have a sketch process and if so, can you walk us through it? AB: I start by printing off a number of side and plan views, sometimes with series branding and start sketching ideas—sometimes ten to twenty. From that, I then transfer four to six over to the computer for the first round of design. These are often an eclectic mix so I get a tighter vision with the client for the second round of design. We then focus on two to three designs, and I say we as I feel this has to be a collaborative process with the team or sponsor. EM: What are some of your favorite designs over the years and where do you find inspiration? AB: Team Need for Speed was a series of liveries which had to work as a collective across a range of vehicles and disciplines, from relatively conservative GT racing to Time Attack and drifting. Lark McLaren F1 GTR, Saudi Falcons BMW Z4, the P1 ‘Chupacabra’ Mercedes AMG GT3, and of course the FCP Euro Golf are all some of my favorites! As for inspiration, that can come from general design or just knowing the form of a car. If a client had a higher-end look, then I use more of the car's body lines for example. Also, the corporate identity of the main sponsor plays a huge role in the look of the car. This isn't a hindrance, but instead a starting point. EM: Typically, how long does it take to design a livery from start to finish? AB: This varies from design to design. A simple two tone is just a few hours whereas a livery like the "Chupacabra" Mercedes took a significant number of hours. I know I put more hours into the initial sketch process and the final production form. I normally focus on around three rounds of design. EM: What are some of the struggles you faced when designing our livery, and did the hatchback/widebody influence the design at all? AB: From the outset, this livery was to be an evolution of the previous design. SRO series branding takes up quite a bit of space, so fitting that in with the three partners and while keeping some negative space around the branding can be a challenge on smaller cars like the GTI TCR. The biggest challenges I ran into on the GTI TCR are the contours on the front bumper and wide rear fenders. EM: What's the highest number of sponsors/partners you've had to include on a livery, and how do you manage it from a design perspective? AB: I can think of one design which had around 12 logos on the side. In these instances, you try and create a row or column of the smaller partners on the rocker to allow space for the main sponsors. The livery as a whole has to work around the main sponsors. One of the most difficult cars to work on currently is the McLaren 570S GT4 as it has a massive air intake along the side of the car. You have to fit sponsors and the race number within the wheelbase which can be a challenge. Working with Andy on our liveries for the 2019 season was a fantastic experience. We're incredibly proud to have had his help with our design this year and can hardly wait to see our TCRs with the new liveries on track. As I type this, both cars are getting their new wraps—you can check out our motorsports Instagram for updates on that process. The first race of the season is approaching fast, with just over two weeks until we arrive in Texas at Circuit of The Americas. If you want to see our new liveries in action, you can visit race.fcpeuro.com for the entire season schedule.